With over 30 years experience working in the food and beverage industry in Chattanooga along with a variety of venue locations, themed events, caterers, restaurants and private clubs, we will be happy to provide suggestions and basic planning ideas to help you with any event. Upon hiring us for your function, full consultation services will be included: We will meet with you personally and even visit your event location to plan set up, rentals, complete bar consultation, everything down to when the ice will be delivered. 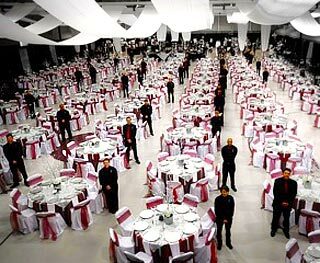 Black Tie Affair has a select staff of mature servers and bartenders with a confident, professional flair and style. With years of food and beverage experience we have the ability to take charge of all your entertaining needs in accordance with your own special style. Dinner parties, corporate functions, brunches, pool parties, pot luck, the choices are endless when it comes to entertaining. Our select servers, bartenders, and sous chefs are cross trained to assist with any in home hosting needs. You will never have to lift a finger while we maintain food service, bartend, cocktail, answer the door, hang coats, keep the kitchen clean and then provide complete clean up at the end of your party. You will be able to entertain your guests during your event and at the end enjoy the luxury of having nothing to clean up. Please call us for your next corporate event! “I just wanted to thank you for everything you did to make Club Lib a huge success. I really appreciate being able to depend on you to take care of so many of the details concerning food and beverages. We could not have done it without you.” Becky M.